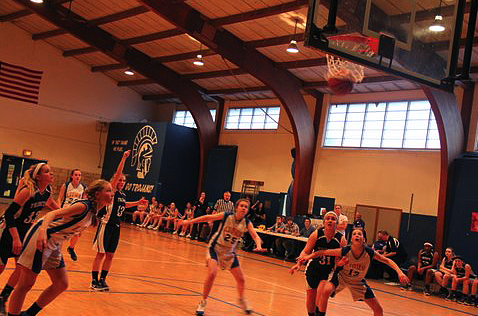 The girls’ varsity basketball team from Trinity School at Greenlawn edged out Lighthouse Christian Academy of Bloomington, Indiana, to win the state tournament of the Indiana Association of Christian Schools (IACS) on March 3. “We felt a lot of momentum remaining from last year, when we came in second in the same tournament with basically the same players,” says junior co-captain Christen Havard, who plays post. Katie Was and Marilyn Preuss. 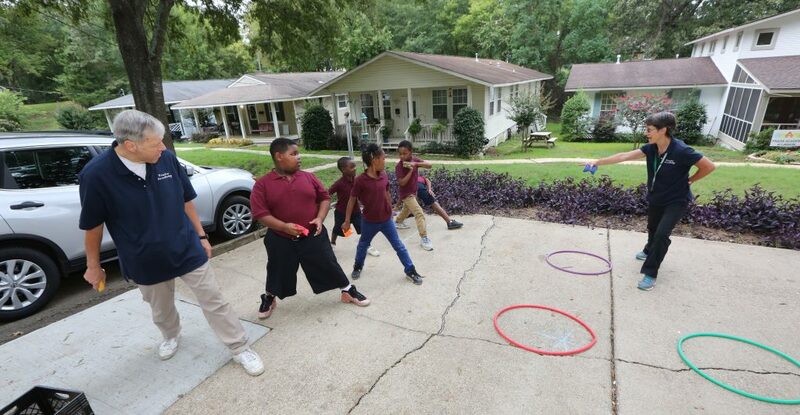 Trinity started out slow, with Lighthouse making the first few baskets. 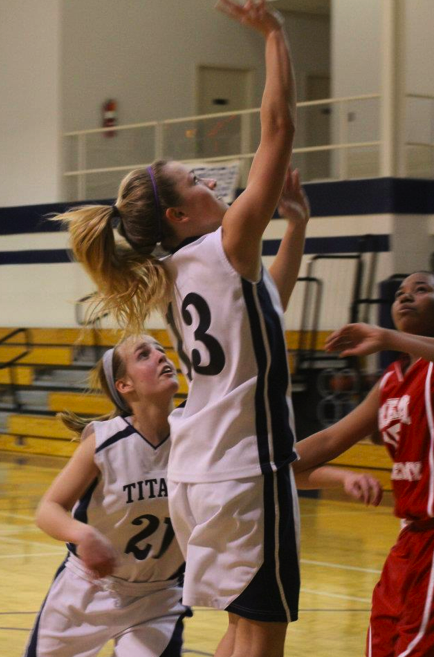 “Eventually Molly Hoover made a three-point shot that rallied us,” says Marilyn Preuss, a sophomore playing post. At the end of the first quarter, the score was 11-14 Lighthouse. The lead seesawed from team to team in the second quarter. “I was frustrated,” says Christen. “I wasn’t getting rebounds and shots. But I was more concerned with how the team was doing. We started accumulating fouls.” At the half, Trinity was still down 18-22. At the end of the third quarter, Trinity was behind by the largest margin of the night, 26-32, but the tide quickly turned. Molly Hoover made another three-point basket, and Trinity managed not only to catch up but to fashion a six-point lead from which Lighthouse never fully recovered. Molly Hoover, Katie Was and Christen Havard in the championship game. “Coach had taught us how to close up games,” says junior guard Katie Was. The girls ended the season with a 19-5 record. Hooray! 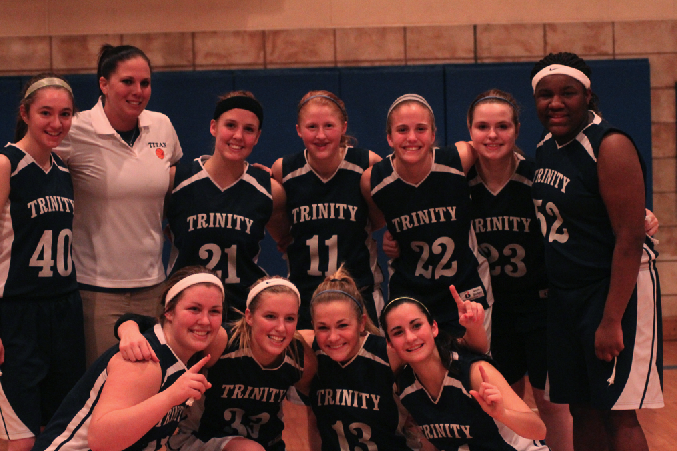 Congratulations, Trinity girls!! Sounds like an exciting game. Way to go, Titans, what a team!! We are all extremely proud of you! So proud of the girls for working together and working hard to overcome the opponent. It will go a long way as they struggle with life. God Bless! Well done girls! I really wish I could have been there to see the game. Next year should be very exciting! Way to go, girls!! Yay, Christen & Marian! Congratulations, Trinity Titans!!! Sounds like a real nail biter, but you came through for a triumphal win. Keep up the great work. Sounds like a fun game. Good show! Way to go, ladies! Team work rules! Congratulations, we are proud of you!